The basement renovation into a family room and other useful spaces such as a laundry room, bathroom, walk-in wardrobe storage, do-it-yourself workshop, sewing room, professional office and even a private daycare, allows to greatly increase the value of the home. The basement which is often used to store boxes and other objects and where one does not want to stay too long is suddenly transformed into a cozy design family room and becomes the ideal place to spend time with family, entertain the kids, useful for the maintenance of the house, welcoming groups of friends and even a source of income. 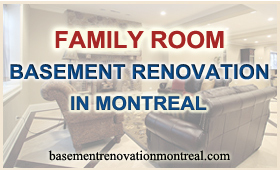 The group of entrepreneurs and professionals of basement renovation Montreal takes care of guiding you in transforming your basement into a family room from beginning to end. First, one of our specialists takes care of meeting you to listen to you and look with you at the ideas of the project to renovate the family room you have in mind and gather useful information such as: sketches, photos, budget, plan of the home now, take a survey of measurements, seeing image references on the Internet, municipal regulations if you want a business office in the basement, a private daycare at home or another special project for family reunions and other useful information. Following this the renovation permit is received from the plan and the basement renovation is done turnkey. Before you begin the renovation work of the basement into a family area it is sometimes necessary to move all the boxes and objects that occupy the basement to make room for the contractor. A shed on the outside can be built to store all the objects or one could even convert the attic. Once the service offer has been accepted the basement becomes, in a few days only, the family room you have dreamed of.